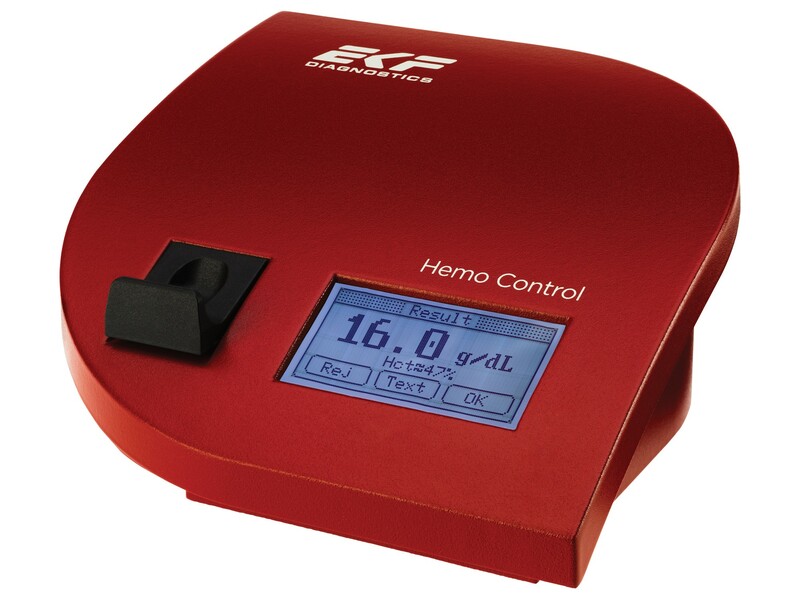 EKF Diagnostics has recently launched its next generation Hemo Control point-of-care diagnostics analyzer, providing laboratory accurate hemoglobin and hematocrit results in one simple test. Uniquely the new hemoglobin POC analyzer enables full upgrade with Data Management functionality as required, giving the user complete flexibility over their future connectivity options via its bi-directional interface. To discuss the this new product and the functionality it delivers we spoke to GlobalProduct Manager Hematology of EKF Diagnostics, Katja Lemburg . JR: EKF has recently released its next generation Hemo Control point-of-care haemoglobin analyser. What are the key features of this new product? KL: As an already premium product in point-of-care haemoglobin and haematocrit testing, the latest generation of Hemo Control analyser serves to further strengthen this position. We have enhanced data management and connectivity functions to facilitate simple direct integration with the customer´s existing IT- environment, a request that we are increasingly being asked about in the POC market. The next generation Hemo Control offers a high degree of flexibility to meet the customer´s connectivity demands as they develop. JR: Despite being a portable, compact device does this new analyser still deliver reliable, accurate results? KL: Hemo Control delivers lab quality results. We guarantee a CV of ≤ 2% and a correlation with the NCCLS reference method of >0.98. The typical measuring time is in the range of 25 to 60 seconds, depending on the level of haemoglobin in the sample. The haematocrit result is then calculated from the haemoglobin measurement. JR: As an additional option, it is now possible to expand the devices capabilities with the data management ‘add pack’, what extra functionally does this upgrade deliver? KL: The new Data Management ‘add pack’ is used to upgrade a basic Hemo Control device with data management functions at a later stage. This is ideal for customers who are planning a future connection of POC devices to electronic patient records or LIS, but have not yet decided, or who would like to split the costs of investment. It helps them to keep their options open for upcoming connectivity requirements. For example, in some countries electronic patient data management will become a general requirement in 2017. The Data Management ‘add pack’ contains a barcode scanner, a licence key and connecting adaptor. The upgrade is performed through a simple web based registration process. After the upgrade the device automatically supports the handling of patient and operator IDs, traceability of materials and QC schemes. On the Hemo Control Manager version of the device these features are supported from the beginning. JR: Why is the ability to offer flexible connectivity options and access to bi-directional interfacing an important quality of this new product? KL: Bi-directional connectivity allows the control of multiple POC devices in the hospital from a central unit, such as the laboratory. Using bi-directional interfaces the central unit can remotely monitor, update and configure the POC devices, and test results can automatically be downloaded from the devices into electronic patient records. JR: How and where is Hemo Control used? KL: Hemo Control is used for POC testing of haemoglobin and haematocrit in primary care settings, blood banks and hospitals. Haemoglobin and haematocrit are key parameters in the diagnosis of anaemia, the most common blood disorder affecting about 25% of the global population, and Hemo Control is used worldwide in anaemia screening programs. In blood banks the level of haemoglobin is tested prior to donation to ensure the safety of the donor. Often blood banks are directly integrated in hospitals and perform haemoglobin testing routinely. Also within hospitals, anaemia can be caused by blood loss, e.g. after trauma or major operations. Here the decision for a blood transfusion must be taken quickly and the effect of the treatment monitored closely. POC haemoglobin devices like Hemo Control deliver fast lab quality results directly in emergency rooms or operating theatres. Other areas where Hemo Control can prove useful is within neonatology where small sample volume is necessary, as well as oncology clinics where rapid results are required prior to treatment. Katja Lemburg was speaking to Jack Rudd, Editor for Technology Networks.